The sight of chocolate stains on your carpet can make you cringe, and the dark color left behind may have you doubting the chances of ever being able to remove the stain. But by applying a few cleaning methods and solutions you can remove much of the stain to put your mind, and eyes, at ease. Chocolate stains might look scary, but it's possible to remove them. 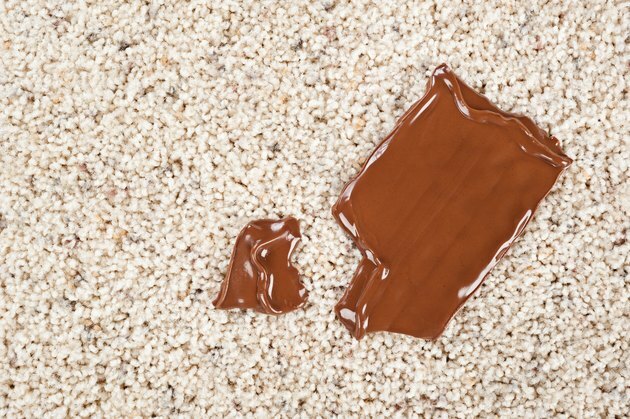 As with most stains, the longer you wait to treat chocolate, the longer it has the chance to set and become more difficult to remove from the carpet. The sooner you can begin the stain removal process, the better. However, with chocolate, it's best to let it dry first and then quickly proceed with removal. Let ice covered with plastic or a towel sit on the stain's surface to help speed up the drying process. Once the chocolate has dried, begin by scraping off whatever residue you can with a butter knife, and vacuum up any remaining particles. Heat an iron on it's lowest setting, and cover the stained area with a paper towel. Lightly run the iron over the paper towel without using any steam. This method helps lift the chocolate from the carpet by making it stick to the paper towel. Replace the paper towel with a new one, and repeat until the paper towel no longer picks up any residue. Do not increase the heat settings as you iron or leave the iron sitting on top of the paper towel or carpet. Use a carpet cleaner to remove the remaining chocolate stains by spraying the stain generously. Let the solution sit on the stain for a few minutes, and then blot with a clean, wet cloth working from the outside of the stain to the center. You can also mix 1/4 teaspoon of dish soap or laundry detergent into a cup of room temperature water and apply it to the stain with a clean cloth, working again from the outside to the center of the stain. If the stain still remains, repeat the cleaning process. Remove the cleaning solution you used by rinsing the area with a clean cloth and cold water. Blot the area dry with paper towels. Allow the area to air dry, and then vacuum it before anyone walks over the carpet.